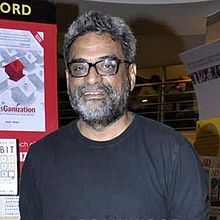 R. Balakrishnan, popularly known as R. Balki, is an Indian filmmaker, screenwriter and former Group Chairman of the advertising agency Lowe Lintas (India). He is best known for directing Cheeni Kum (2007), Paa (2009) and Pad Man (film) (2018). He started, his career with Mudra at the age of 23. His passion had always been filmmaking; after college, he even applied to the Madras Film Institute to do a course in direction. However, he did not like the panel that interviewed him, so he walked out. After this, he got into the Masters in Computer Application (MCA) course in a college directly opposite the film institute. He always liked computers, so he thought that he could do well in this course. After studying there for three years, he was thrown out in the last year because of lack of attendance. According to him, this was mainly because he played a lot of cricket and watched a lot of movies. He saw an ad in the papers for Mudra and he remembered seeing it after Buniyaad. The ad asked people to send in 100 words describing who they were. His idol was Ramesh Sippy when he started his career; he wished to emulate him in advertising and got to meet Sippy only much later. Balki's ideas have included "Daag Achche Hain" for 'Surf Excel', "Jaago re" ads for 'Tata Tea' and the "walk when you talk" Idea Cellular advertising campaign. He has written and directed Cheeni Kum (2007), which starred Amitabh Bachchan and Tabu. His second feature film was the critically acclaimed and commercially successful Paa, (produced by Sunil Manchanda), released on 4 December 2009, starring Amitabh, his son Abhishek Bachchan, and Vidya Balan. Shamitabh is his third Bollywood venture starring Amitabh Bachchan, Kollywood actor Dhanush and Akshara Haasan, making her debut in the film. The film released on 6 February 2015. His recent directed movie "Ki and Ka" released on 1 April 2016 starring Kareena Kapoor and Arjun Kapoor. Ilaiyaraaja, the noted Indian composer, is his favorite composer. Balki once commented, "My biggest inspiration has been Ilaiyaraaja's music; it was his music that got me interested in cinema in the first place." He collaborated with P. C. Sreeram. Balki has been married to Gauri Shinde since 2007. She is an Indian ad film and feature film director. Paa received 14 nominations at the 16th Star Screen Awards and won five awards of those. ^ "Kamal Haasan's younger daughter Akshara to jump into Bollywood arena". Tamilstar. ^ CF (4 September 2013). "Akshara to follow Shruti's footsteps into tinsel town". KOLLY TALK. ^ "Revealed – Kareena Kapoor's Look As 'KI' In R. Balki's 'Ki And Ka'". 29 July 2015. ^ LUNCH WITH BS: R Balki, Business Standard, Shobhana Subramanian. ^ "Archived copy". Archived from the original on 14 August 2012. Retrieved 14 August 2012. CS1 maint: Archived copy as title (link), Hindustan Times, 14 August 2012. ^ Nominations for 16th Star Screen Awards, Star Screen Awards. Wikimedia Commons has media related to R. Balki. This page was last edited on 28 March 2019, at 05:44 (UTC).